Access to sound climate information is vital for anticipating climate-related risks and adapting to climate change. The seamless integration of weather and climate information in government, non-government and private sector decision making can help mitigate against the risks of disasters, weather and climate variability, climate extremes and other related events that threaten vulnerable communities around the world. Climate information is generated through monitoring and analysis activities conducted by meteorologists and climate science-related researchers. This information is becoming an integral part of risk management and resilience programming and is seen as vital to enhancing people’s capacity to deal with the impacts of climate change. Equally, the production of climate information for decision-making is increasingly being seen as an entry point for joining up work on climate change adaptation, disaster risk reduction and development in climate-sensitive places. This paper* summarises and assesses existing weather and climate information for BRACED programme countries. It describes some of the drivers of weather (such as El Niño and the Asian monsoon), and how these contribute to variability in Africa and Asia. It then reviews information on existing climate services available in and/or for BRACED countries, highlighting state-of-the-art approaches and products in each area (see Annex 1 of the full text for a matrix of available weather and climate information sources). The paper highlights some problems in the use of this available information, including issues of quality, appropriateness of scale and how information is communicated and interpreted. *Download the full text from the right-hand column or via the link under further resources. The key messages and constraints on the use of climate information are are provided below. Please note that references have been removed - please see the full text for more detail. Also available in French - see the Further Resources section. Access to, use and application of weather and climate information in Africa and Asia is increasing. Yet end-users face various challenges in applying the information they receive. This is related to the quality of the information products, not having information at appropriate scales and difficulties in communicating and interpreting the information produced. Climate information should be service-orientated and integrated into decision making from national through to the community level. The success of resilience programmes will depend on their ability to create opportunities to strengthen climate services in country. Additional support is needed to (i) strengthen the capacity of information providers, so they are able to produce more localised, timely and accurate climate information; and (ii) institutionalise two-way communication, between producers and end- users, so those who need it can continue to use information over time to build resilience. 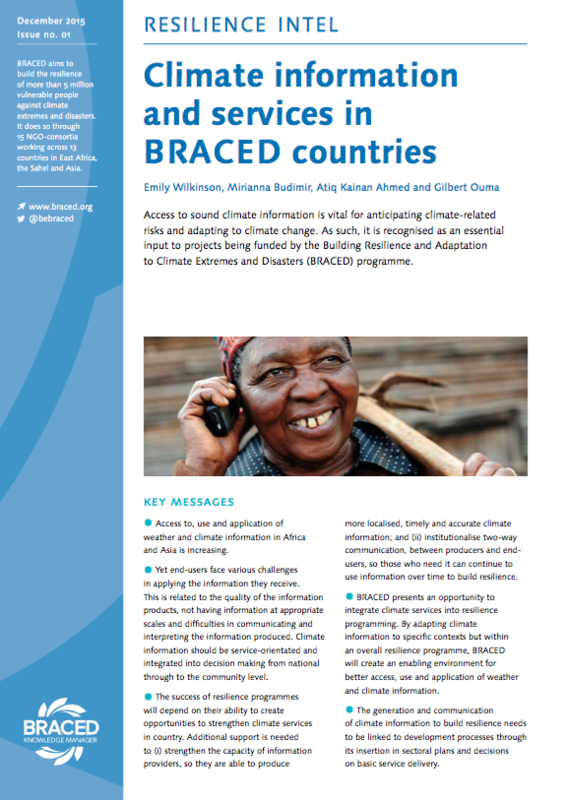 BRACED presents an opportunity to integrate climate services into resilience programming. By adapting climate information to specific contexts but within an overall resilience programme, BRACED will create an enabling environment for better access, use and application of weather and climate information. The generation and communication of climate information to build resilience needs to be linked to development processes through its insertion in sectoral plans and decisions on basic service delivery. Due to the cost of installing and maintaining these weather stations, African countries have very few, and often with poor spatial distribution, meaning the resultant information may not be relevant to specific local-level use. The sparseness of the networks also makes validation of data from each station almost impossible, since the nearest stations are very far removed and may even be in different climate zones. Although some NHMS stations are manned by permanent meteorological department employees, the majority are staffed by volunteer observers from other government ministries and agencies, schools and even farmers. This raises issues on accuracy of and timeliness of transferring the data since the observers are not under the direct supervision of the NHMS. For several reasons, including lack of stationery, civil unrest, breakdown of equipment and closure of stations, there are gaps in the historical records, which limits statistical analyses. Downscaling seasonal forecasts to locally homogeneous rainfall zones or to weather station level, so small-scale local variations in rainfall patterns can be taken into account, would enable smallholder farmers to take decisions at the farm level. The temporal scale of the data can also be very important. This is usually a factor in data derived from satellites, whose repeat observation durations vary depending on the orbital altitude. If an application requires more frequent data updates, for example when monitoring floods, data with monthly repeat observations are of little use. Despite improvements in climate information products, they are not widely utilised owing to a lack of communication and familiarisation. This often occurs when the information producers lack adequate communication processes and are not focussed on providing a service. Communication of forecasts has been taken more seriously in recent years, with improvements in public weather services, by creating awareness and education programmes, campaigns, targeted initiatives and media outreach. Communication of uncertainties is also important but end users require processes that show them how to manage these uncertainties. Closer interaction between the information producers and end-users of climate and weather information can help in this regard as well as guidelines for communicating uncertainties such as those provided by the WMO. Interpretation: Weather and climate information products are not well understood. Traditional climate information products are not sufficiently user-friendly and the same information is often given to all users without advice on thresholds for action. Users are unable to interpret the risk information correctly or take appropriate action in response. This is regarded as a gap in early warning and forecast systems. Regular two-way communication between providers of information and decision-makers (at all levels) is needed to enable the co-production of information relevant to decisions that need to be taken. Useful forecasts are those that meet recipients’ needs in terms of attributes such as timing, climate parameters, spatial and temporal resolution and accuracy. One of the key reasons for local communities ignoring the warnings for typhoon Haiyan in 2003 related to their interpretation of the language used. The term ‘storm surge’ used in early warning and forecast systems was found to be particularly problematic: many people did not expect that the wind generated by a typhoon would lead to such a high surge from the sea. People’s knowledge of the phenomenon was low; they perceived the event differently and ultimately, they could not interpret the warnings using local knowledge frameworks and lived experiences of tropical cyclones and associated risks. Close attention needs to be paid to the issues identified above. More ‘policy- first’ and ‘problem-centred’ research programmes are needed, as opposed to ones that prioritise the generation of new science and consider its application a secondary concern. Read the related article "The changing role of NGOs in supporting climate services"
This paper was written by Emily Wilkinson, Mirianna Budimir, Atiq Kainan Ahmed and Gilbert Ouma.